Scent Specific Trailing Search Dogs follow a scent trail looking for / following human scent particles. These search dogs do discriminate scent e.g. they are given an article of the missing persons clothing and will then hunt for a trail that matches that scent. Once the dog finds the scent they will ‘indicate‘ the trail to the handler and then they will follow the trail to the missing person. On finding the missing person the dog will ‘indicate‘ the find to the handler who then ‘rewards‘ the dog with their favourite toy and/or food whilst heaping lots of praise on them. 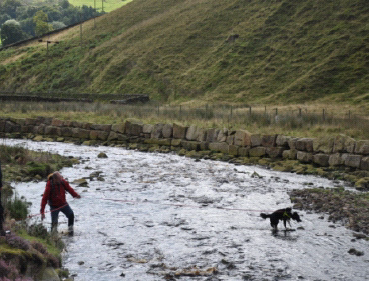 It is this ‘game’ through years of training that drives the dog to find the missing person. This week's Connacht Tribune has a piece about one of our newly qualified mountain rescue search dog teams, Jarlath Folan and Syd. Jarlath is one of our veteran handlers who was previously on the callout list for several years with his Springer Spaniel Hugo. We are delighted to now have a search dog team in this part of the country again. Jarlath is also a long-time member of Galway Mountain Rescue Team. We wish this fine pair the best of luck with all their future callouts! We've got some great pictures to show you over the coming weeks as our dogs (and handlers) have been working hard in the heat.